KIA has announced a deal to create additional storage capacity at its UK import and distribution centre in Stallingborough, Lincolnshire. The company has appointed 3PL Real Estate to be its exclusive property consultants on the project. The partnership saw them jointly broker an agreement between Kia and an investor to secure 16.8 hectares of land from Associated British Ports and draw up the related construction contract. The current site covers 35.6 hectares of land and with this additional space, Kia’s overall capacity will increase to 52.6 hectares. The multi-million-pound development, awarded to Clugston Construction Ltd, highlights the confidence the brand has in the UK and its continued presence within the UK market post-Brexit. The UK is the brand’s fifth biggest market globally and Kia ranks in the top 10 of car brands in the UK for sales. Situated three miles from the Port of Immingham, the current distribution centre is a key hub for all Kia models entering the UK from its European factory in Slovakia and its plants in Korea. More than 92,500 Kia cars were imported into the UK in 2018 and this figure is expected to rise in the coming years. Kia has ambitious plans to sell 100,000 cars a year by 2020 with over a million Kia models having been sold in the UK since the brand first started in the UK in 1991. The new facility will take 32 weeks to construct and is expected to be fully open by November 2019. It will employ up to 80 staff at any one time who will move over 200,000 tonnes of soil, lay 33,000 tonnes of tarmac and paint 43 miles of white lines. There will be 2,600 square metres of tree planting and concerns about the natural world have been taken into consideration. A total of 9,000 square metres of wetland habitat will be created with swales and ditches providing habitation for local wildlife. 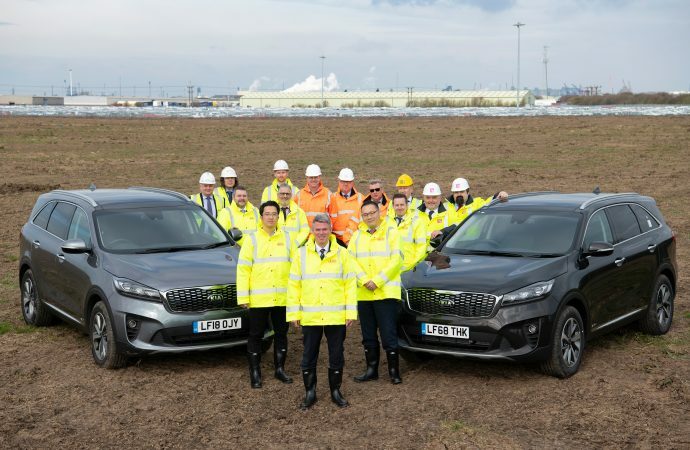 In the picture, Paul Philpott, centre, president and CEO of Kia Motors UK, is shown at the ground-breaking of the new storage facility with representatives of other companies involved in the project.